Loy Krathong is a holiday celebrated on November 12th here in Thailand. You are probably asking yourselves why I am posting about this so late, and I have no good excuses. I don’t know why it has taken me three weeks to write about it. The holiday was explained to me as being an opportunity to ask Mother Nature for forgiveness for all of the bad things we do to her, primarily for all of the bad things we put into the water systems. 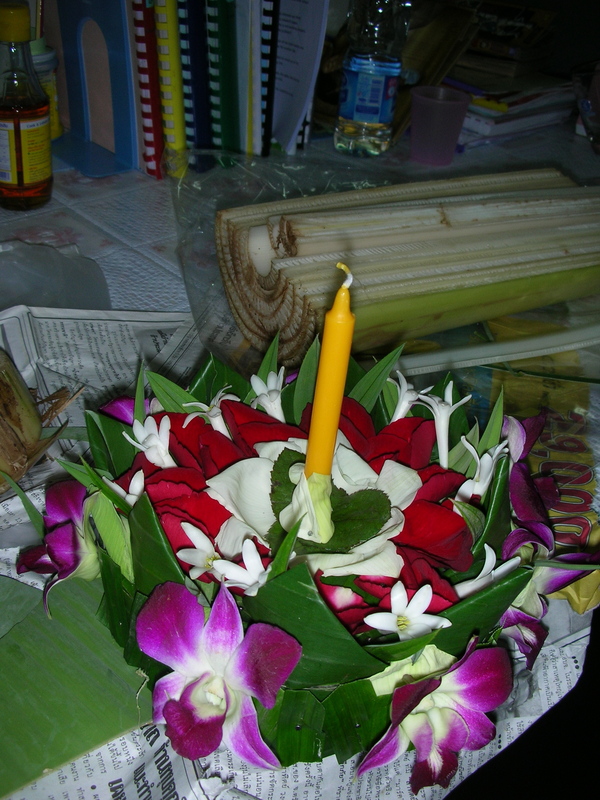 Everyone makes krathongs (little rafts) out of slices of banana tree trunks, banana leaves, and flowers. Candles and incense are placed in the center along with some money and possibly some fingernail clippings if you so desire. As you release your krathong into the river (or lake if you don’t have a river) you are supposed to say a prayer for forgiveness and I think you get to make a wish, at least that’s what I was told. The irony of the holiday seemed to be completely lost on almost every single participant. Loy Krathong is a big festival here and is much like a county fair. There are games, tons of food, and many many shops. The amount of trash that piled up by the end of the night was horrifying. Nobody seemed to notice that on the same night we ask for forgiveness for all of the bad things we do to the environment we were also destroying it. Not to mention the obvious fact that while we ask for forgiveness for polluting the water we are putting yet another piece of litter into the water. My float was made out of a banana tree that one of the girls who taught me to make my krathong cut down from her neighbors yard. So not only were we littering in the lake, we were also killing and stealing trees. 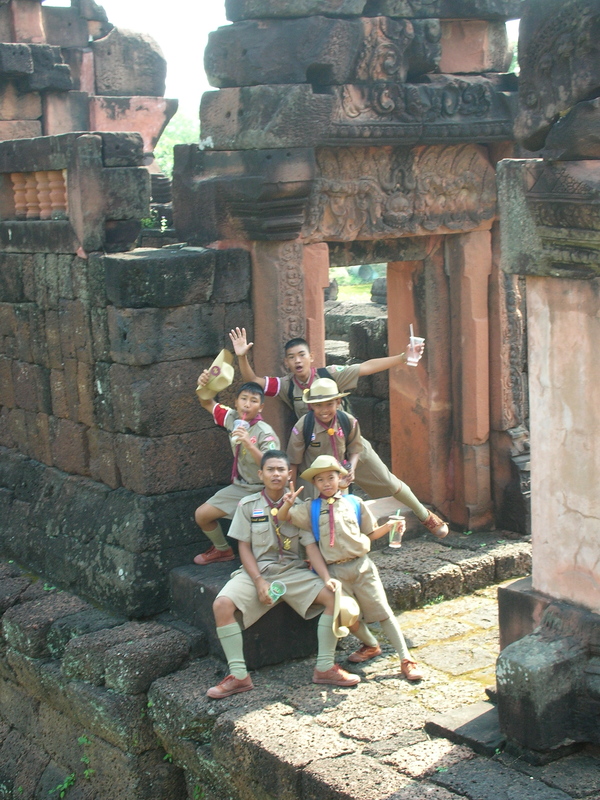 At least our krathongs were made out of biodegradable material though. Some people make their krathongs out of styrofoam, which makes me wince to think about. Of all things to ask for forgiveness with, they choose styrofoam?!? An environmentalists worst nightmare! Other than that, Loy Krathong was very fun. I tried a corn and coconut waffle which was surprisingly good and had a great time making my krathong. 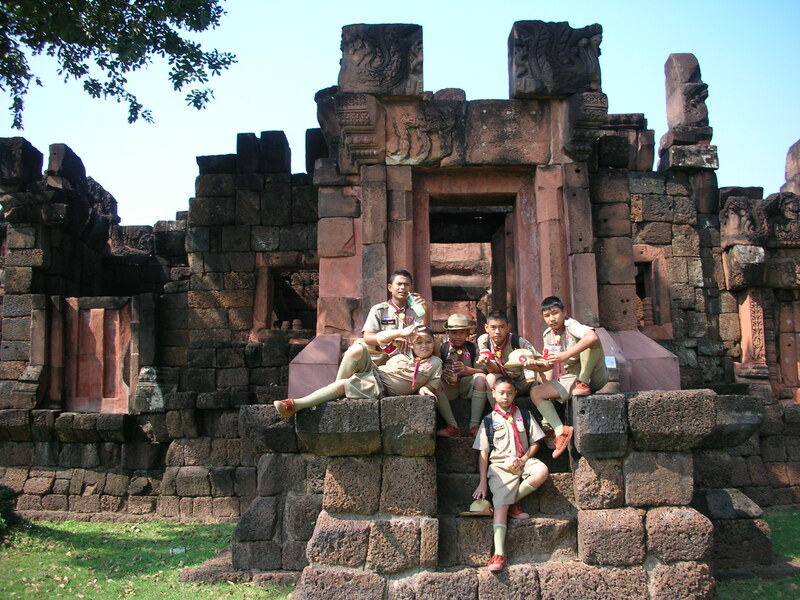 Here are some pictures of the krathong building party we had. I kept asking myself what would Martha do if she were given some pins, banana leaves, and flowers…here are the results. The Krathong I made. I used banana leaves, orchids, lotus flowers, roses, and some other white flower. 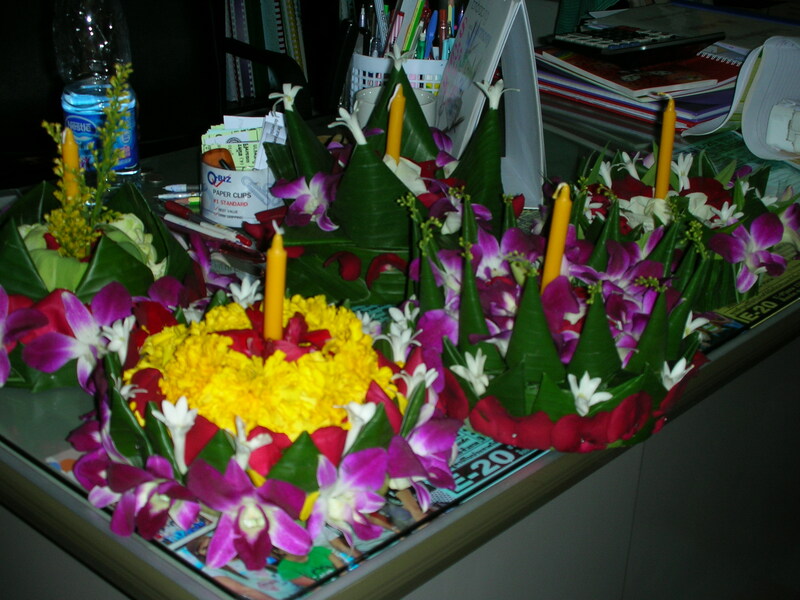 All of the krathongs we made. Mine is in the back to the right. 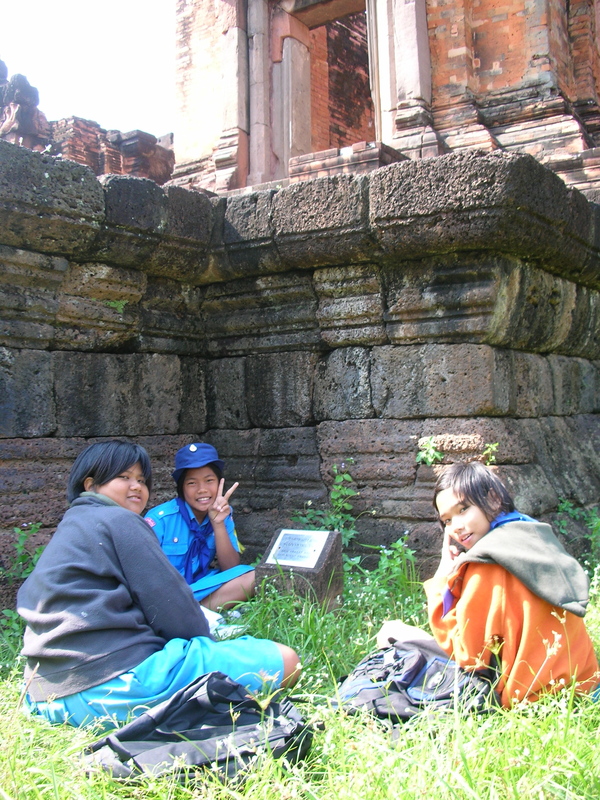 A week ago I went on a field trip with two of my sixth grade classes to Prasat Pueai Noi, which is about an hour outside of the city. 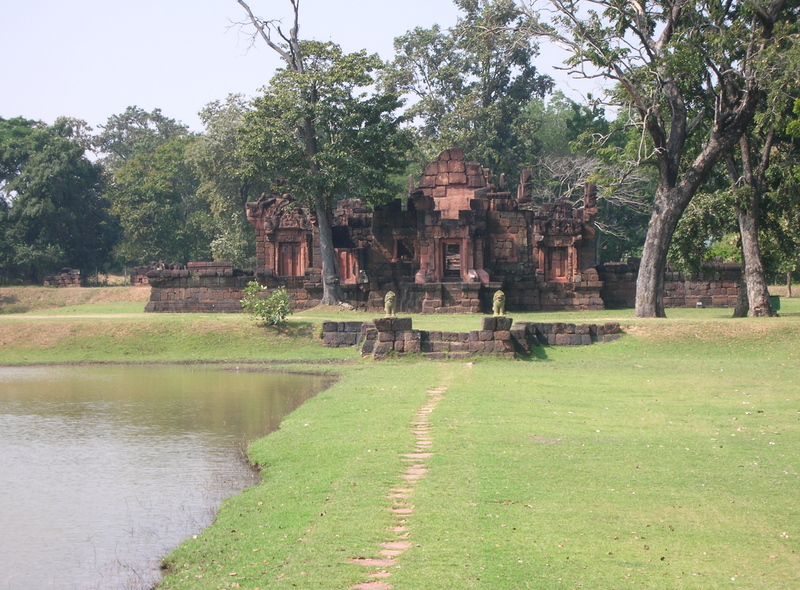 I was told that we were going to “a temple…kind of,” so I wasn’t quite sure what to expect. 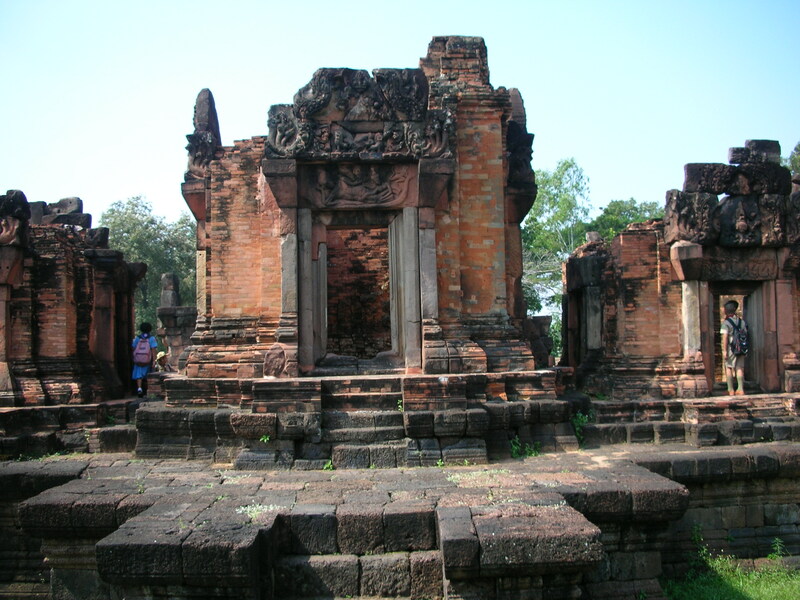 It turned out to be the ruins of an old castle which was the largest Khmer sanctuary in the Northeast of Thailand, at least according to the sign at the Prasat, it seemed a little small to be deemed the largest though. 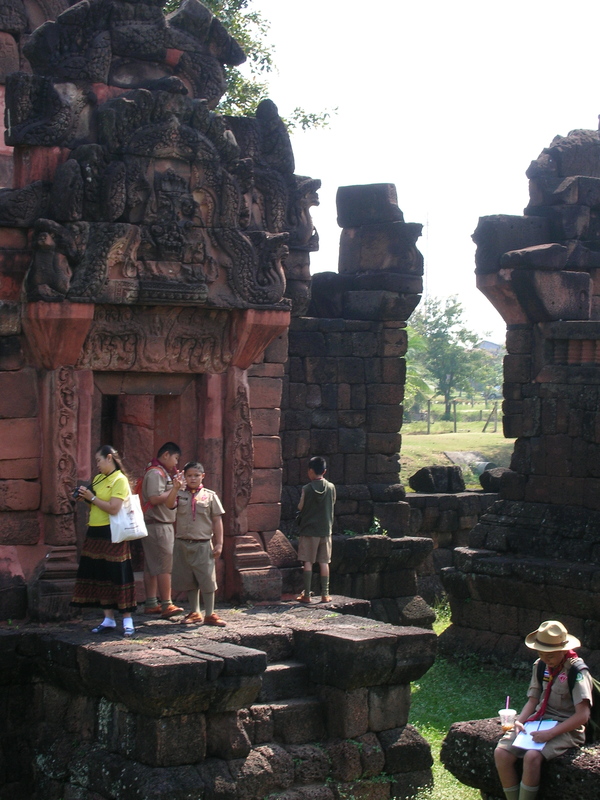 It was used as a Hindu temple, which is only obviously evident by the remaining carvings of Vishnu on some of the beams. I’m not sure the description I would give of our field trip bus would really do it justice, so here is a little video of it. I was kind of excited at first because I thought I would get to ride in the back (in the cage) with the kids, but I am really glad I didn’t because on the way back to school two kids hurled everywhere. I was very thankful for being smushed in the front with the other two teachers and the driver after that. P.S. Regarding the political situation here, don’t worry! I am so far away from Bangkok it hasn’t changed my daily life at all. Thanks for all of your thoughts though, and Jet I will totally take you up on your offer if I start to feel like things are getting bad. Thank you so much!